All your print mixing needs taken care of in one dress! Gorgeous, Krystal! I love the polka dots and how print mixing is integrated right into your beautiful dress. Love the yellow blazer, Krystal! You have such a lovely smile! this outfit is superb. love the mixture of patterns and the pop of color. more please!! Adore the yellow paired with the polka dots...super cute! the dress is stunning! looks amazing with the yellow blazer! Great outfit! Love the prints! New cut looks great also. So LOVING this, you look GREAT! What a fantastic outfit! You look amazing! I mean let's face it. You've got great stems. OMG, Krystal, I love your new haircut!! Amazing outfit as well. I am loving that pop of yellow in this outfit! loving your hair! :) and the polka dot umbrella. the spotted dress and umbrella are so cute! Love the combo of stripes and polkadots. Two of my favorite patterns! The yellow pop makes this whole outfit reminiscent of a bumble bee. In a good way. YAY! i love seeing this blazer...i have it and need inspiration on how to wear it! totally adorable, love that dress and the blazer is divine! You look gorgeous! I've allways loved black + white + yellow + gold! Pretty sophisticated! This dress is perfection and i love that you have a polka dot umbrella. Gorgeous dress! And short hair looks amazing on you! I love this haircut on you! You look all ready for spring, even if SF isn't yet! Love the umbrella! So cute!! I absolutely love this outfit. The pop of yellow added to the polka-dot dress was a great addition. Just wonderful! Super cute dress. I like that it combines two things most people wouldn't think to pair together. The yellow cardigan is a great touch. I could see a hot pink or a cute red cardigan pairing for future outfits. Fun pictures....Love the polka dot mix! That blazer and umbrella are both to die for! Love the bright blazers for spring - colorful and trendy, but just light enough to keep you warm in the evenings and on rainy days. I am obsessed with your dress!! Mixing prints is SO much fun. Love that you paired your polka dot umbrella with your dress, smart choice. Cute blog. These Emerson Fry shoes I'm giving away would look sups cute on you. Love the mix of polka dots with the stripes! Love the mix of polka prints!! You look as lovely as always! You look beautiful in your new hair! 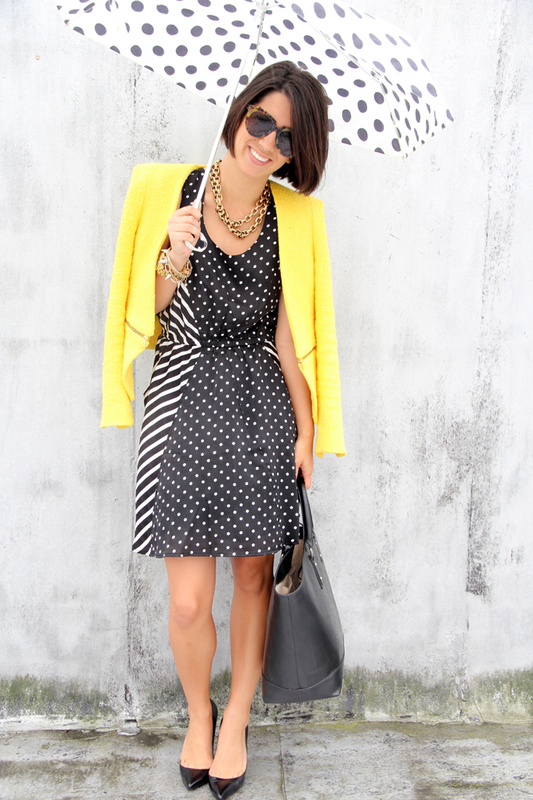 Stripes and dots just work so well together and love the pop of yellow! great look! those CB pumps are classic. happy weekend! You cut your hair! Sooo cute! have a great weekend! Absolutely love the combination of polka dots and stripes! Great blazer, yellow is my fave color of the season 2nd to coral. My favorite, polka dots, and sunny yellow..... What a way to put the sunshine on this outfit!!! LOVE! Please stop by my new blog and let me know what you think. this is absolutely darling. adore it. xo.